Hero’s GoPro cameras attract budding photographers with their great photo and video quality, durability, compact size and waterproofing, but their price point can become a sticking point. 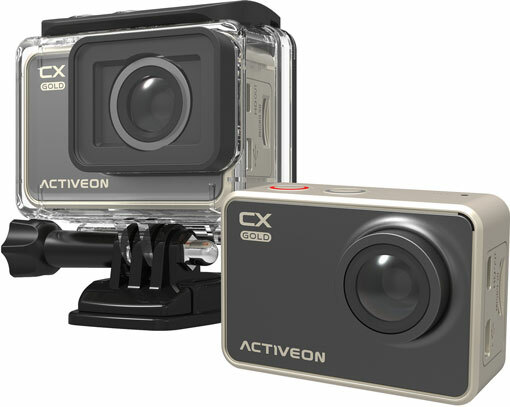 The new Activeon CX Gold action camera offers a comparable camera at a fraction of the cost. Lightweight and compact at 1.6” by 2.4” by 0.9”, the Activeon CX Gold can go almost anywhere with you on your extreme outdoors adventures — mountain biking, base jumping, surfing, skydiving, you name it. This action cam is designed for rugged use, so you can expect it to be shock-proof and able to withstand extreme conditions. The CX Gold takes superior-quality video and photos with a high-precision f/2.4 super-wide-angle lens and a high-res, 16-megapixel professional grade CMOS sensor. You can snap that fleeting moment in full, vivid color or film at up to 1080p full HD resolution. Most action cameras increase the angle of view to capture more of a scene than can be seen on the viewfinder, producing images with a fish-eye effect. The CX Gold lets you reduce the fish-eye appearance by setting the field of view to medium or narrow. Controls are easy to access and use. The 2-inch touchscreen features an intuitive user interface that allows you to easily adjust the camera’s exposure (brightness), ISO (light sensitivity), white balance and aperture exposure (AE, or amount of light at a given exposure). The touchscreen also controls filters and special effects such as black-and-white, sepia, negative, green, warm, sports, night and aqua. Other touchscreen-controlled features include immediate recording when you turn the camera on, preset settings for many kinds of environments and activities, time-lapse recording, slow-mo recording, 4x digital zoom video recording and digital image stabilization. Control and monitor the camera remotely using a smartphone and the Activeon app for Android or iOS devices. The rugged CX Gold is protected by a waterproof housing (capable of withstanding depths up to 196 feet or 90 meters). The cover is easily removed for charging or simple photography. The Activeon CX Gold is expected to carry a price tag of $249 to $300 when it becomes available in stores this fall. For more information, visit the CX Gold’s official home page. Have no action cam but need help with taking active shots with your smartphone? See our tips on how to fix the five most common photo goofs on your smartphone.